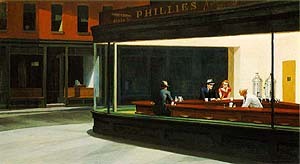 Sure, Nighthawks (left) can be seen in just about every diner across America. But it is only a representation of Hopper's broad body of work that captured stillness, solitude and light in an era when such sentiment and realism was out of style. Hopper, considered by many as the first significant American painter of the 20th century, has also proved the timelessness of his work. His appeal has actually significantly grown over the last 50 years. Few had the ability to find a balance between art that was meant to be thought-provoking and art that was meant to be aesthetically pleasing as Hopper did.